“The work has seemed daunting at times, but many hands have made it possible,” said Roberta Cobb, chair of the PCTA’s Mount Hood Chapter. The Eagle Creek fire burned 49,000 acres in the gorge, including 10 miles of the PCT and 90 miles of other trails. Some trails, such as the popular Eagle Creek Trail, remain closed to the public. 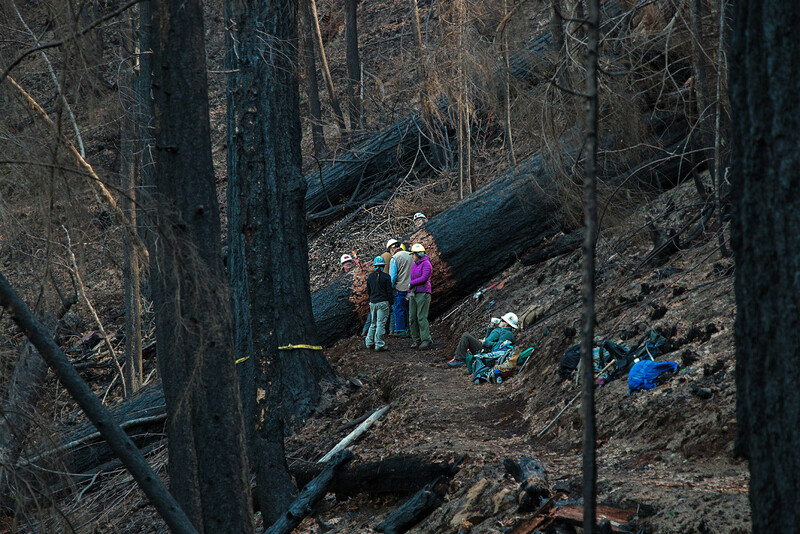 In the aftermath of the fire, volunteers and staff from the PCTA, Trailkeepers of Oregon, Friends of Columbia Gorge and Washington Trails Association quickly formed the Gorge Trails Recovery Team. Last October, the PCTA’s Mount Hood Chapter began training volunteers for the massive effort they knew they would need to re-open the PCT. 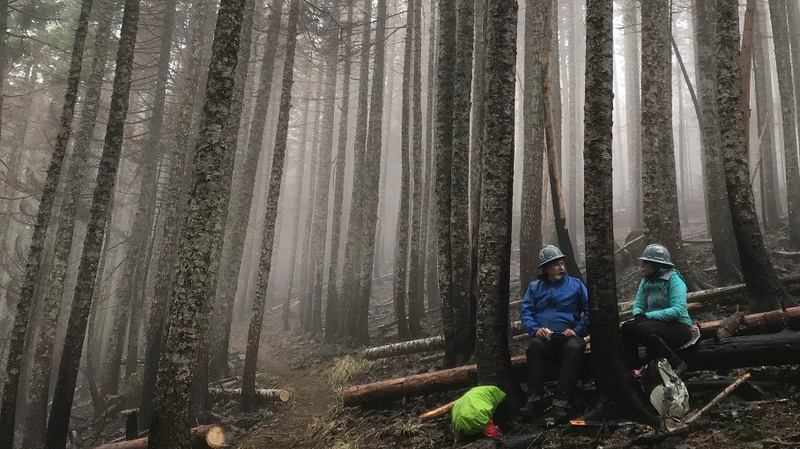 The first PCTA crew entered the burn area with the U.S. Forest Service on the PCT just south of Cascade Locks on Jan. 17. Long days, steep hills, and hard work. Working in a burn area presents tough challenges. 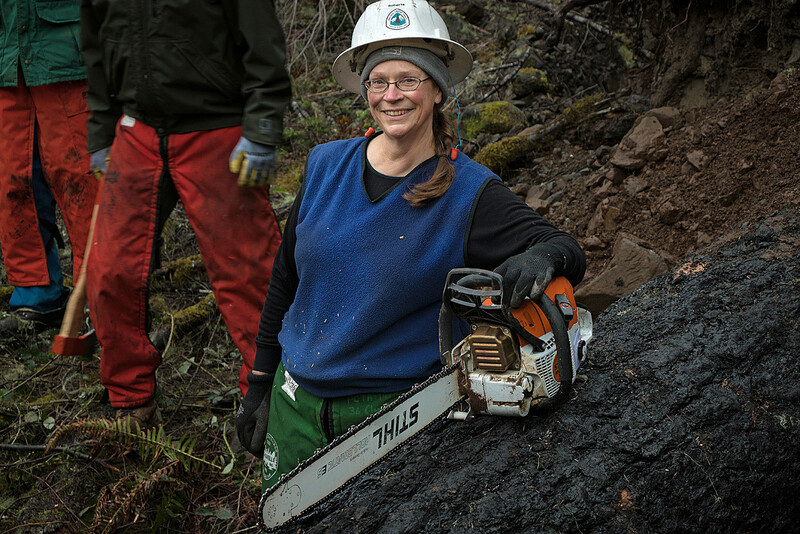 In addition to steep hiking and long days required for any crew working in the Columbia River Gorge, volunteers had to contend with fire-caused hazards such as loose rock and soil, burned branches that could fall and underground voids left by burned tree roots. 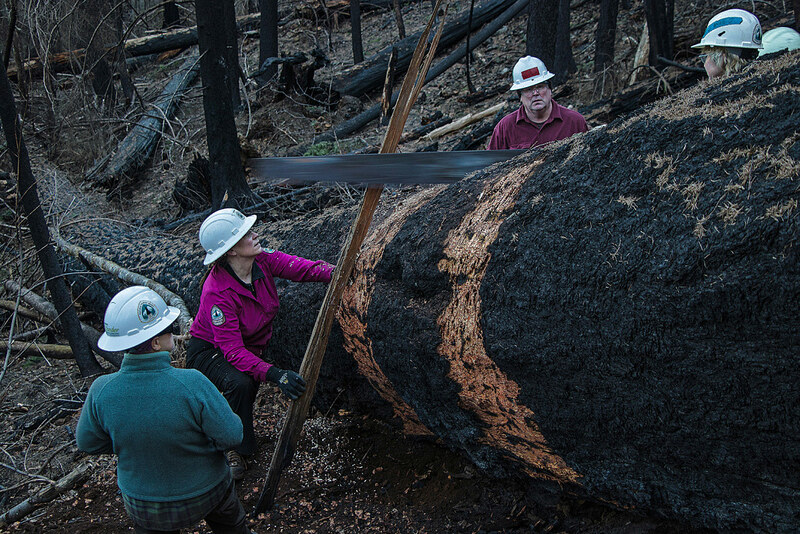 Volunteers removed 210 logs from the PCT and nearby trails. 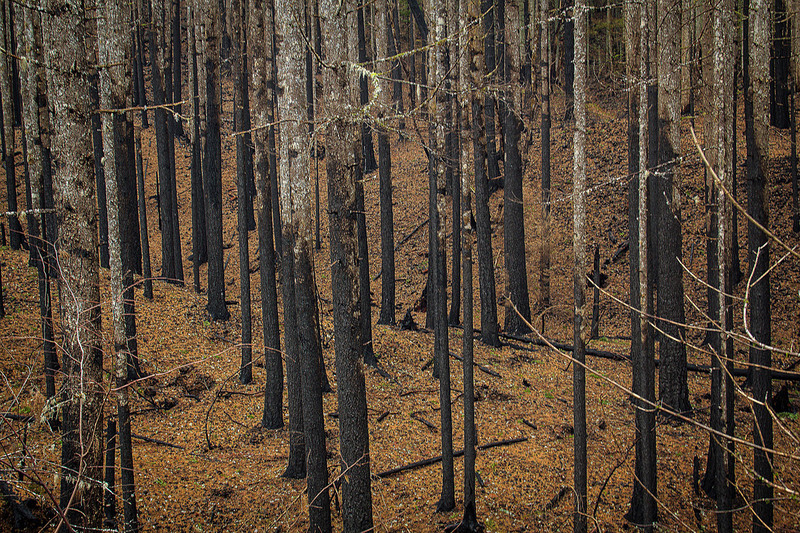 Despite their best effort, their saws dulled from the charred wood. The PCTA is very lucky to have strong volunteer crew leaders, who have both the technical skills to get the work done and the ability to keep their crews safe in these challenging conditions. The PCTA is very grateful for all the volunteers and partners at the U.S. Forest Service for getting the trail open so quickly. Many volunteers took days off work to help. Frank Jahn, a volunteer crew leader extraordinaire, often led three or four crews a week to clear rocks and limbs from the trails. After long days on the trail, many satisfied and sooty volunteers visited Thunder Island Brewing in Cascades Locks to enjoy delicious beverages, which the brewery donated! Tackling yet another log and feeling great about it! Photo from the South Benson Plateau in June 2018. Thanks to Kristi Kose for the photo. 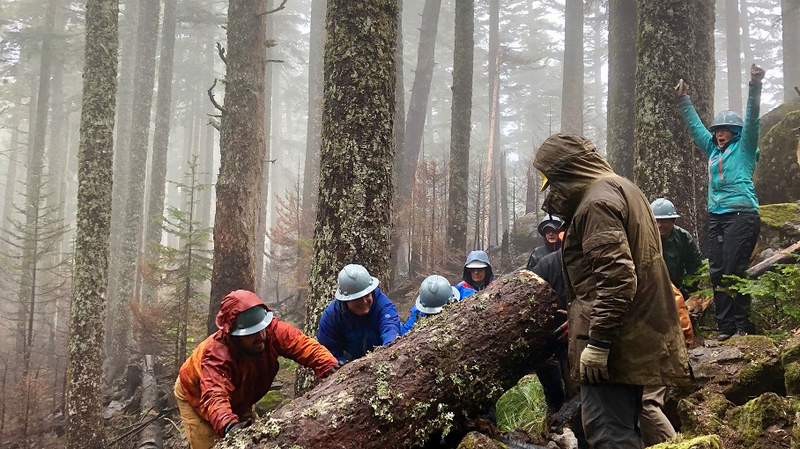 Even though the PCT is open, much work remains, and the PCTA’s Mount Hood Chapter hopes that volunteers will be just as eager to join crews as when the trail was closed. A new PCTA Crew Leader, Max Martin, has been hired to continue to lead crews in the Gorge, thanks to a grant from the National Forest Foundation. PCTA Mt. Hood Chapter volunteers are out there in cold, rain and snow. We’re used to it. It’s just too much fun and there’s too much work to be done to stay at home. Photo by Hilary R.
Though Mount Hood Chapter volunteers have focused much of their time this year in the burn area, they haven’t neglected other parts of the PCT, they’ve contributed more than 12,500 hours so far this year. They help maintain 250 miles of the PCT and feeder trails, from just south of the Goat Rocks Wilderness in Washington to Breitenbush Lake north of the Mount Jefferson Wilderness in Oregon. Find out how you can get involved!